This is not a cartoon. Because the film is so far over-the-top, so insanely unbelievable, so über stereotypical, gory, packed with clichés and silly dialogue, and generally so cartoonish that it's hard to believe the films was made with live actors. The classic jailhouse drama The Shawshank Redemption has famously reigned at the very top of IMDB for a very long time, as the best film in history. 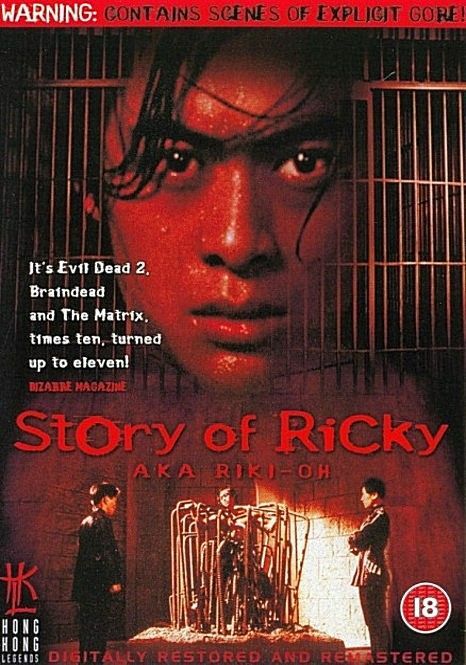 Riki-Oh is also a jail-drama and if I had to watch one of them again today, it would be an easy pick. 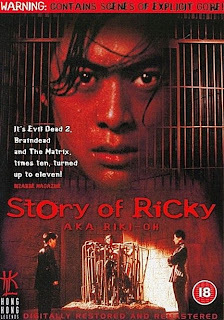 Ricky is the superhero Troma wish they created. The film is loaded with hilarious ultra-violence that is so absurd, you'll laugh till it hurts. All the fight scenes will make you cheer, as one body part after the other explodes in a mushy strawberry jam, and the more serious scenes feature characters that look like they escaped from the cast of Pirates of the Caribbean. Of course there is also a monster or two in there as well. The film is originally in Cantonese, but was also dubbed into English at some point. And although I always prefer to watch any film in the original language it was made, the dubbing of Riki-Oh is so silly, it just adds another level of absurdity to the whole thing.